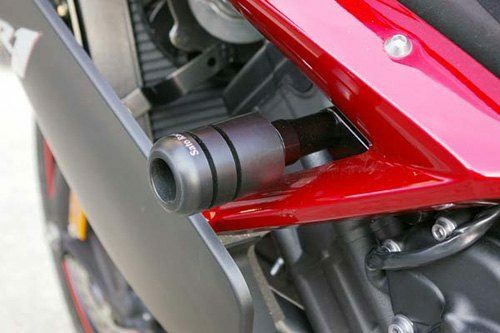 The Sato Racing Frame Sliders for the 2007-2008 Yamaha YZF 1000 R1 are designed to mount without any modifications to the body work. A CNC machined billet mounting plate provides a strong and secure mounting point. The Sato Racing slider itself is made of Delrin for strength with the ability to absorb energy and slide. Lesser materials can shatter or crack. Combine these with the Sato Racing Front Axle Sliders, as well as the swingarm spool sliders for great protection on the street or track.